I interact with lots of folks who ask that I review their website and suggest changes. Many people are well-intentioned to join social media or build a site as a marketing outlet to promote themselves, their business, their thoughts, their organization, or their community. This does not always meet web design need: the need to meet other’s objectives. There are many tools available to launch an manage a quick website. There are many companies that offer to build you a site. However, I get many site owners tell me they unsatisfied with the look of their site or the results of their efforts. Form follows function, not the other way around. Do I Know Web Design? Since the mid-90s I’ve designed websites and portals. To learn the basics to build a site my boss had me write web pages with a basic TextPad application and enter every html tag. Building a Fortune 500 website this way was neither fast, easy, nor, always fun, but it was a great foundation that still helps building sites today. I do not claim expertise in website design or development, a site is always a work in progress. The balance to strike is constant between content, technology, design, and coding. I empathize that something always sacrifices with these 4 in play, and since I have a full-time job and family life I value, I try to make sure the content and those tools to share content are which of the 4 I most focus. What is the intended reward for an Internet or social media investment? That is a personal or business goal that may, or may not be, aligned to the an Internet commons approach. 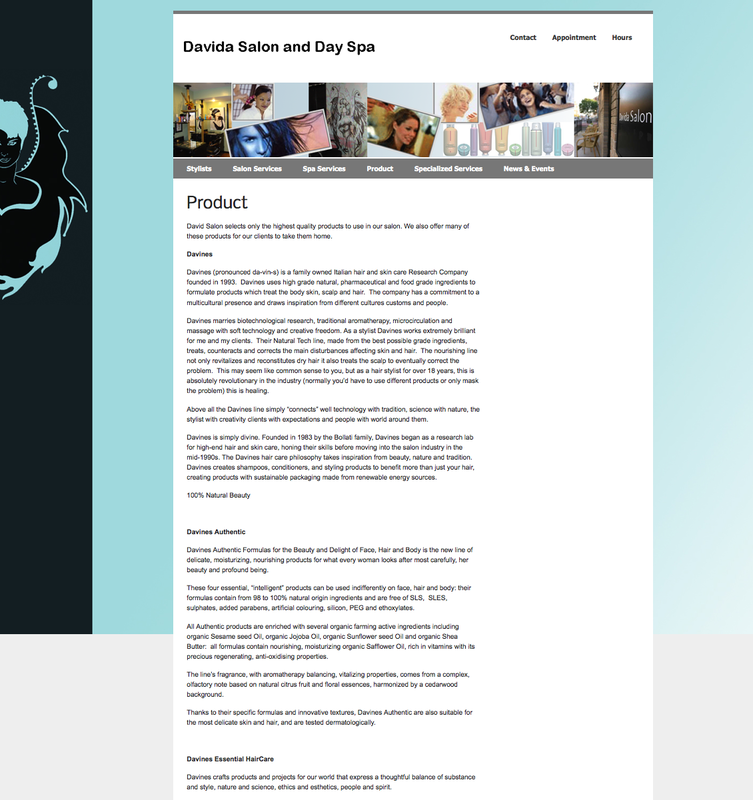 The owner, Davida, asked that I look at her site and give advice on what to change. She and others are not satisfied with the current site and I told Davida I would take a look and also give her sources to the points I make so she can see, from other experts, why I suggest the change I suggest. Sourcing, or transparency, is one of the most important principles for the Internet, my goal to source is to give credit and give capability for anyone to see for themselves. 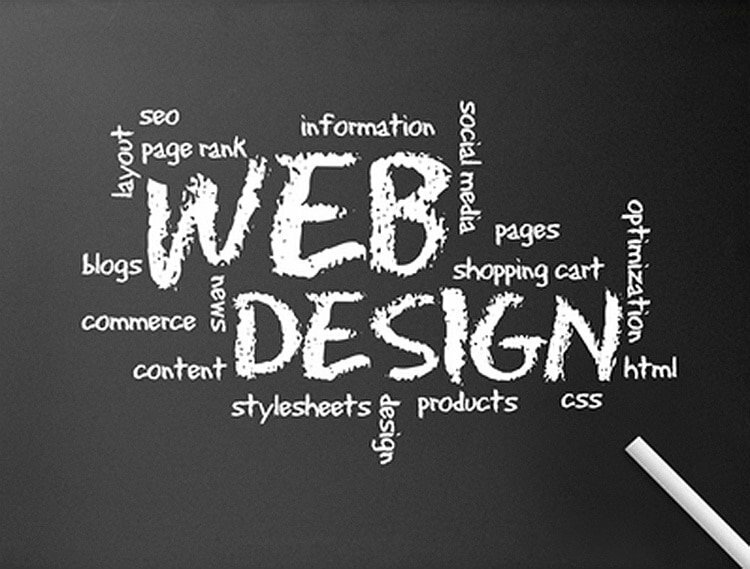 The objective of the sources is that she has more confidence to talk to her web design company on critical changes. Though well-intentioned in her desire to design and launch a site, she is frustrated not being able to articulate what to change. The technology or tools available should never confuse intent. Too many tools blur the effort and I’ve seen this too often whether an internal SharePoint site set for corporate collaboration or a small, local business. Should Davida’s design company offer Davida more strategic insight? Perhaps. But I said I would take a look and provide my view for her to take steps to build a better experience on the web to meet the great experience in her salon. After I wrote this Davida agreed that I share the note. If you see changes you would make or other suggestions please contribute them. She, and I, are keen to add and prioritize other thoughts as she wants to build something her clients find valuable and merits the great skill and service Davida and her staff provide. Here is what I put together from looking over your site. There is a lot here, a lot that many people do not use or do, but I wanted to give you the item, the detail, and the source for you to see someone else talk about it. Why put up the time and money for a site if it is not going to get found and people are not using it the way you intend, or worse, potential customers are turned off by the web presence? Lost business and a website design that does not meet intended needs hit your business revenue and profit. Throughout the comments below I use Google and search engine results the same way. Google is the biggest in the word, there are other search engines: Bing, Yahoo, Alexa, but similar principles and strategies. The key to getting found on these search engines is to make it easy for search engine robots that crawl the web to identify text (not pictures, not videos, not java) to catalog and relevant results to people’s search. Someone makes a search to find an answer. The search engines make their money providing relevant results. They want relevant information. 60% of all clicks go to the top 3 (organic) results Google provides. A good rule of thumb is that people have a 3 second patience for a site to load and for a cursory scan to find what they need. So both content, design, and site load should really facilitate a positive user experience. Be sticky refers people staying on your site. The back button is the second most used button for a reason. You want people to stay on the site because the site delivers what they came there for. Another design thought is above the fold. This comes from the newspaper business that the important copy goes on the top, above the fold of the newspaper. With smart phone screens in mind, above the fold also refers to content on viewable on smart phone screens. Your website is not a brochure – throughout you need to make a case for your user’s need, not your promotion. We all filter every item of information through What’s In It For Me. When someone lands on any page in a site you solve their problem: I need a haircut. Your site answers their questions: can I trust going here is worth the money and time? Header pictures are to convey what? An experience? They are a mix of stock photos (never the best solution), empty inside space, blurry photos, product, and the sign. Every picture should make a case for its use – a picture is worth a thousand words, what does each current picture say? What does an empty salon represent? Why? What experience do you want to convey to people who land on this home page? 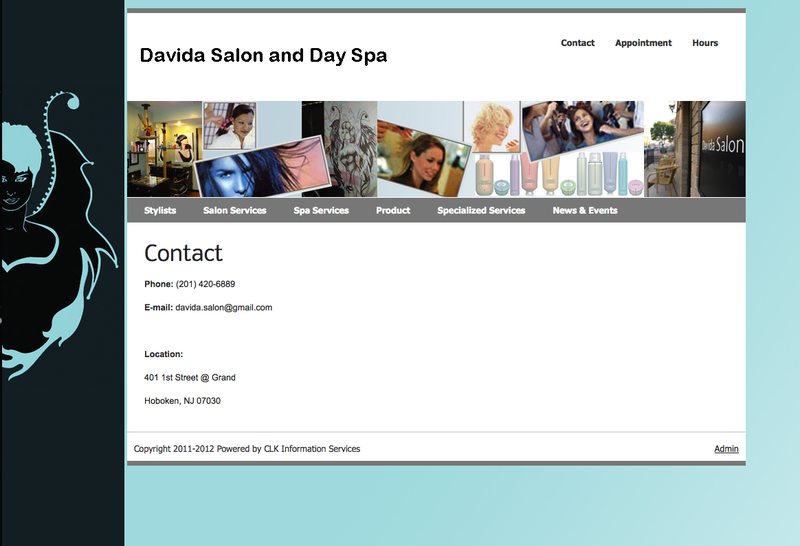 Header is: Davida Salon – A Unique Salon Experience – what does unique tell people? Home page or is it the home page the navigation does not tell: Navigation, where I am, where I was, needs to be clear. There is no “Home” page. The home page starts about you. It is not about you, it is about why someone click and came and wants to stay here. 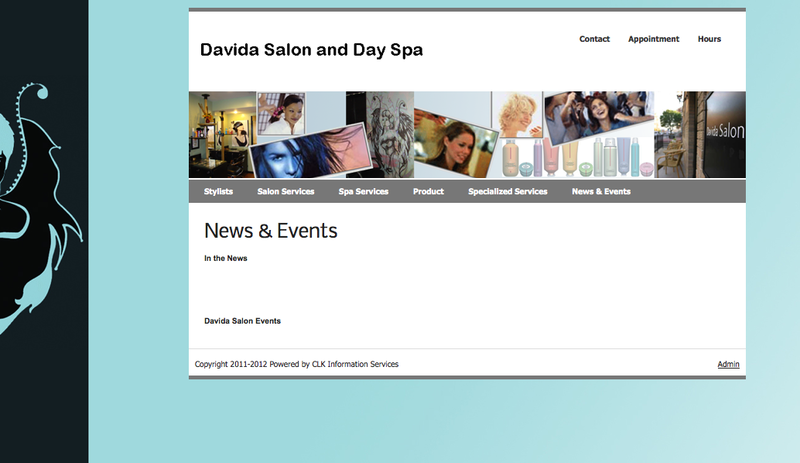 The home page starts with a header About Davida Salon and Spa. 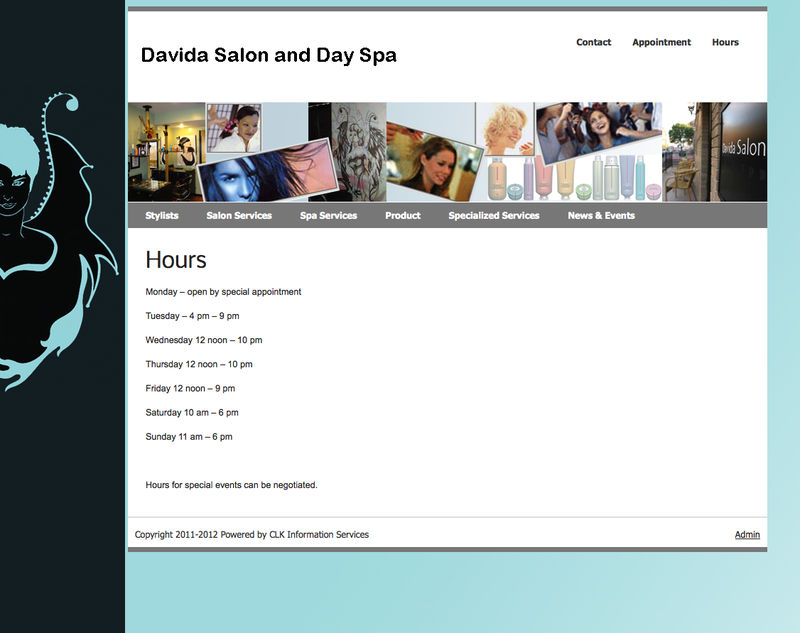 The header is a hyperlink to the salon hours, why? Also, there is no clear indicator it is a hyperlink, so people don’t know to click it, then the anchor text does not tell them “this hyperlink takes you to our hours of operation”. It is like a trap door. Is Stylists your home page? 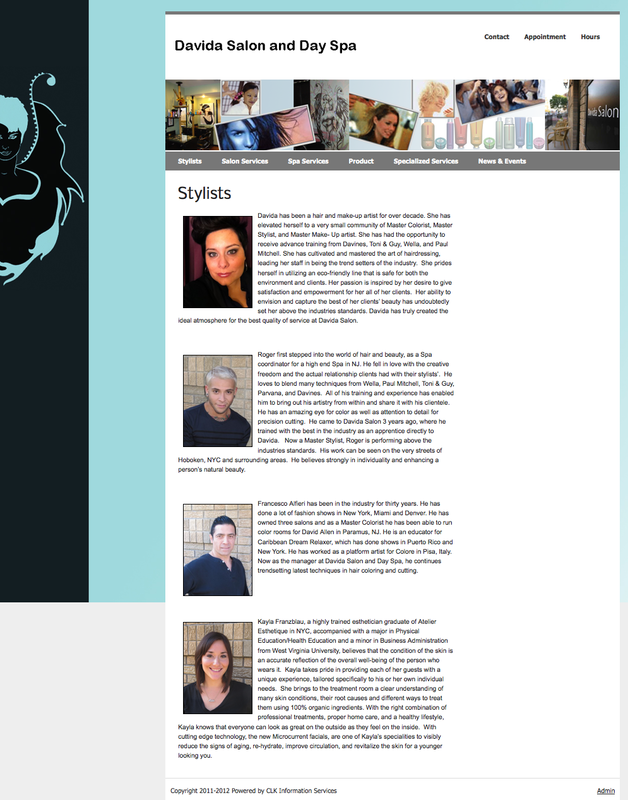 Stylists as home page or not. It is not current and there are no calls to action, it is just a brochure. What do you expect someone to do as a result of this information. Again we need to answer their need, their question, then support their intention with conviction, perhaps bios and accomplishments. The picture on the right, the second column, under the header/banner picture (reiterate above points) is there for what purpose? When you click on the picture you are taken back to the home page where you already are. Get Found: To get indexed by the search engines, picture not identified by search crawlers and you miss value to. Be Sticky: Hover over a picture, get information so someone knows what to do or why. Call to Action: When people click on pictures or links, without information or clear direction it is a leap of faith, when they click where they land should not be a surprise or a disappointment. No keywords, no page descriptions – the text you put in your page description shows in search engine results. 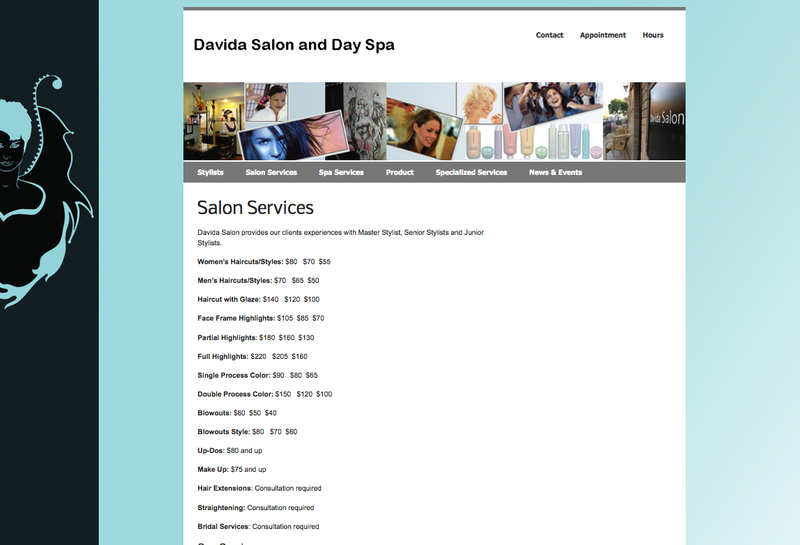 The first word in your page titles is given the most weight (importance), what does Davida Salon tell Google, how does it help Google recommend Davida Salon if it does not know what Davida Salon means? What does Davida mean to Google? Contact, Appointment, and Hours [all screenshots were taken at time of evaluation] pages all do not have descriptions for Google and other search engines to crawl and recommend right content, for the right search, for the right time. Don’t use a Gmail account. 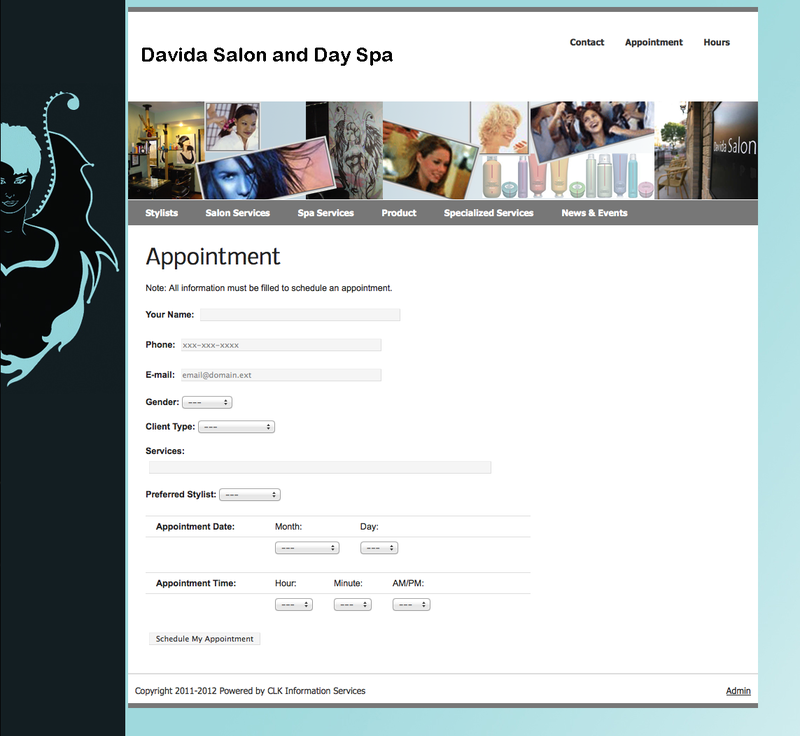 It is easy, and free, to have a name@davidasalon.com account deliver mail to any device you have and to any browser/smartphone you want. Use Google Places for your physical address to leverage your business getting found and an interactive map that will also link to directions. Don’t see Google site verification for Google analytics or Google webmaster tools. What happens when they choose a date/time that is not available, are they expected to keep guessing until they land a correct date/time? 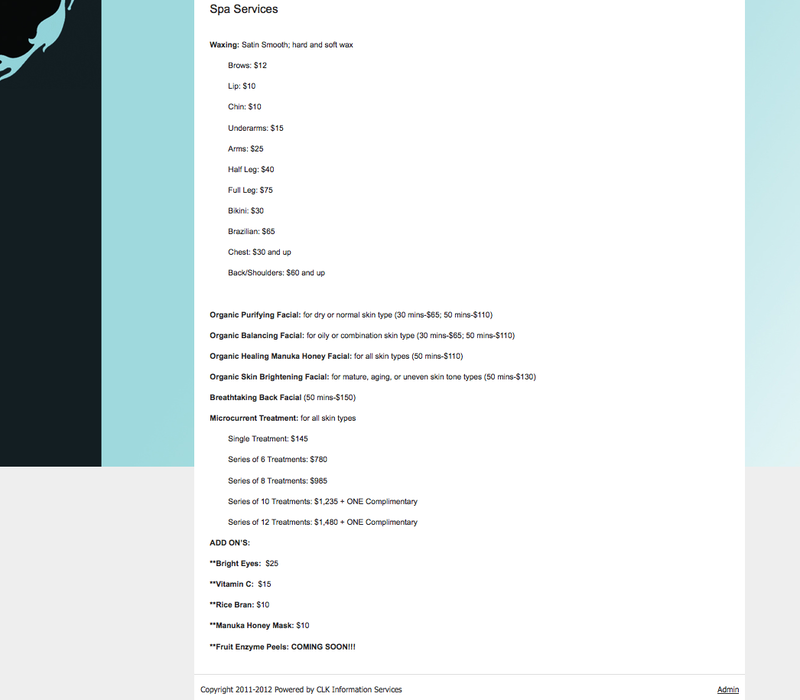 This page is a list, a long list (I would not put prices) you want to kill them with service, their experience, and delight them with how they are taken care of. Strategically what does this long list intend to provide, information? Then what? What is compelling that values the reader’s time. 3 seconds, see above. No social media icons to share, tweet, email, print, like. You want to meet the needs of others to the degree they can not wait to tell someone else about it. Make your strangers your friends, your friends your customers, and your customers your salespeople (Seth Godin). You do not, anywhere on the site, tie in your social media effort, twitter for example. Social media makes it easy for people to follow you however they want to. Social media let’s them know where you can be found at the beginning – this answers the end-user question: So what? So, make the action obvious. Without a strategy there’s no measurable connection of objectives, actions, and a way to measure and monitor what success looks like or what needs modification. You have no software to measure your site effectiveness to see what is working and what is not. Did you pay the company who design the site to build an online brochure or a living breathing web page? You do not know, and the company did not advise?? ?, how many unique visitors you have a month: trending up/down? How they are finding you, what they are using for keywords to search. Nothing above is a disaster, it is just not intentional. Of course Without a strategy you do not know what your resources get you – your time, your staff’s time, are resources just as the money invested to design, launch, and manage your online identity. The intention is to get found, be sticky, and get people in there and talking about you – that leaves your service and the experience you provide as the final deliverable. Feel free to forward this email to the site designer who built this site. You can use this as a check list of things you should change, add, or modify. 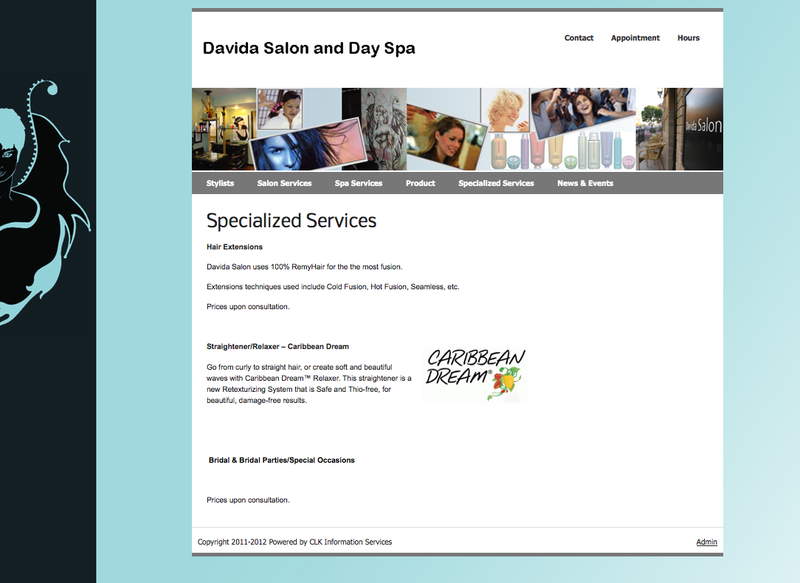 As this is getting worked on we can continue the most important step for good site development: persona strategies to help identify the audience, their needs, and their questions and how you and Davida Salon provide answers, solutions, and exceptional experience. Also referred to as goal-oriented design. This is not everything you can do to launch and manage your presence, but more the table stakes to earn someone’s attention. None of the above items or tools I mention cost any money to implement or add to your site. So, for individual or a small business, or a web design company you pay to build a site, there is no barrier to add these other than the awareness they exist and that there is linkage to how the above items improve your site for the end-user and for your on-going investment. 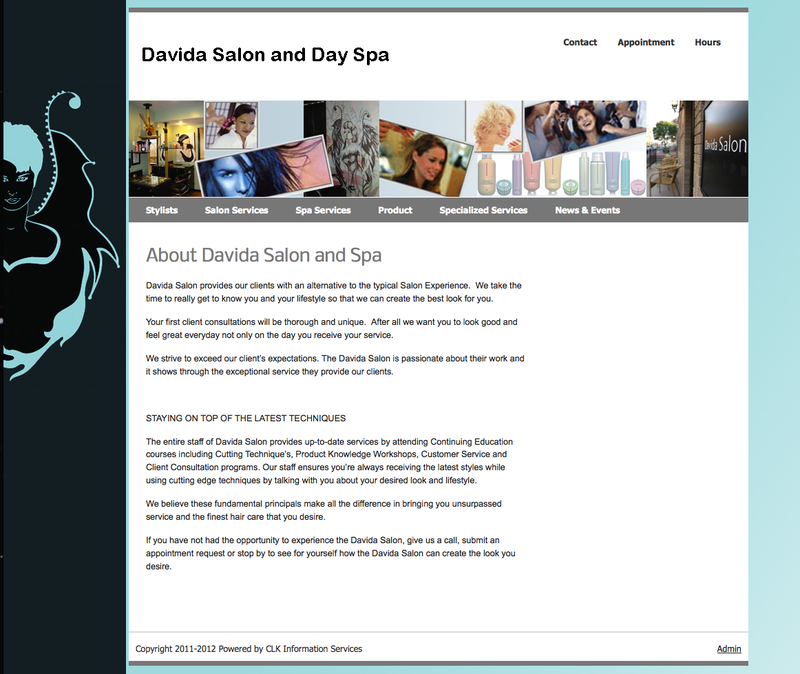 What are your thoughts that would help Davida build a site and presence that current and prospective clients would value? *a note on hyperlinks opening new window or same window – clicking a link and opening a new window on each link usually leaves a reader with a bunch of open windows. I prefer to let the link open within the same window. I take the chance someone leaves my page and does not come back, but I let my content, and the back button on the browser, stand as compelling enough to return.